Driving south through Andalusia towards Almería is an experience of vastly changing landscapes with pockets of unpredictable weather. Beginning from the sunny rolling hills of southern La Mancha, through miles upon miles of olive groves in northern Andalusia, climbing through near freezing rain at 1500 meters, then back down toward the Mediterranean sea, we arrive just before sunset outside the small town of Tabernas at the estate of Oro Del Desierto. "Welcome to the desert!" greets Rafael Alonso Barrau with a teasing smile, one of two sons of the Alonso family who owns and operates the small company. Typically the area is known as having more sunshine than anywhere else in Europe, but lucky for us, we arrived on an unusually wet day, quite untypical for an area well-known for its desert landscape used for making Spaghetti Westerns such as The Good the Bad and the Ugly and Lawrence of Arabia. After sitting down to a welcoming hot cup of cafe con leche in the restaurant run by the Alonso family and located in the same facility as their mill, Rafael eagerly ushers us though the mill and outside to show the day’s olive harvest. “Hojiblanco, my favorite olive,” Rafael says with a smile as he runs his hand through a batch of freshly-picked olives awaiting their turn in the crusher. “Most consumers prefer the more mild oils, but I prefer the stronger, more peppery ones.” We soon agree as we enter the mill and are overwhelmed by the fruity, grassy and pleasantly pungent aroma of the olives in the midst of crushing. Rafael is eager to show us the mill in action as the next day’s weather called for rain, which delays the picking of the olives due to the wet ground. Being that immediate same-day pressing is crucial for producing a quality extra virgin olive oil, we knew there would not be any production to witness the next day when we planned to visit the groves. But no matter, there we were, smelling and tasting the fresh-pressed oils of Oro del Desierto less than an hour after our arrival to the estate. Until recently, Spain had not always been known for producing higher quality olive oils. Only in the last decade or two has the mentality begun to shift with the latest generation of olive oil producers taking over. “We decided that we wanted to be organic from the beginning and focus on quality, not quantity,” states Rafael. In the past, it was typically in the farmer’s best financial interest to produce the most quantity of oil regardless of the quality, while today, many producers are caring more about the quality of their oils, which requires an earlier harvest of the olives, even though it producers a lower quantity of oil. As we drive though the groves belonging to the Alonso family, we see olive trees looking vibrant, healthy and loaded with olives: Picual, Arbequina, Hojiblanco, and Lechin. Oro del Desierto is truly unique in that, even though they are a small company with only twelve employees, they have decided to make the investment in sustainability for the long-term benefits: olive trees on the estate are irrigated by pure, natural well water; mulch left over from the crushed olives is combined with manure to fertilize the trees; pits from the olives are burned to heat the water for the estate; and solar panels cover the rooftop of their facility, harvesting the energy of more than 300 days of sunshine a year. In fact, the estate produces more natural electricity that it can even use on a daily basis. As we wander through the olive groves, we see for ourselves the loving effort and care that has gone into caring for the trees. Spread out in a natural landscape surrounded by small mountains, the groves reside in a unique micro-climate which we witness every minute when the rain begins to drizzle one minute, then stops to let in a brief ray of sunshine, only to begin pouring yet again. We don’t mind, however, as we know how beneficial the rain is for the trees this time of year, when they’ve typically gone months without a drop of water from the sky. When we return to the family restaurant at the mill after our tour in the groves, we are met by Alfonso’s wife. It is there we sit down to experience a meal that is the epitome of local sustainable eating: large cubes of unsalted goat’s cheese, covered in olive oil and local capers, made fresh each morning by Alfonso’s mother; piperrana, a local specialty made with tomatoes, peppers, boiled eggs and tuna; grilled chops of baby lamb accompanied by seasonal artichokes and green peas – all served with a glass of delicious local-variety red wine produced on their estate. Our most memorable dish, however, was a simple dish of sliced home-grown potatoes with their own farm-fresh eggs, fried in olive oil with the essence of chili pepper – something I could surely never tire of eating every day. “Simple food,” we hear Alfonso describe the food more than once. 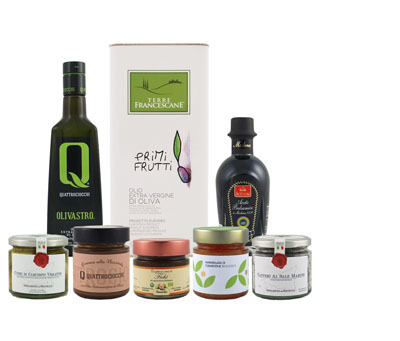 In this culture the focus is on quality ingredients and letting the flavors of those fresh ingredients come through, enhanced by a lot of good quality extra virgin olive oil, of course! Our time spent on the Oro del Desierto estate left us feeling hopeful about the future of Spanish olive oil purveyors and to the health of the land on which it is made. Now our mission at Olive Oil Lovers is to share their dedication, passion and care for quality with other consumers in the hopes that they, too, will appreciate and savor this ‘Gold of the Desert’ as much as we have. See all products offered by Oro del Desierto.